For the most part I am allergic to jazz vocals. I’m not really sure why this is the case, other than it’s just a personal taste thing – not any kind of indictment on jazz singing in general. I definitely appreciate the talents and artistry of jazz singers (for contemporary singers Roberta Gambarini can’t be topped), but I generally can’t get with jazz vocals. For the curious, some of my favorite jazz vocalists are Nancy Wilson – especially that album she did with Cannonball, Frank Sinatra – but pretty much only those records he did with Nelson Riddle, such as Sings for Only the Lonely or Sings for Swingin’ Lovers– although I have to say he did phone in a few of those and are barely worth listening to, and well…those are the only two folks I off the top of my head, I’m sure I have a couple other favorites. 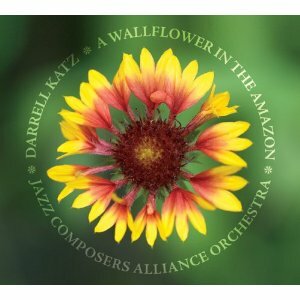 But…there are a two recent albums that I have no problem getting with, albeit for completely different reasons: A Wallflower in the Amazon by Darrell Katz and the Jazz Composers Alliance Orchestra on Accurate Records and a project on OA2 put together by Nich Anderson and Bill Anschell, which features a whole heap of singers and instrumentalists from across the country. These records might not cure my jazz vocals allergy, but they are at least a treat to listen to. When I first popped Katz and company’s disc into the player I had a hard time figuring out why it sounded different than any other big band with vocals album I had ever heard. My inability to pin down this album’s unique approach initially turned me off, and it took a few more spins before I think I got it: singer Rebecca Shrimpton’s phrasing, delivery, diction, etc., seems to be in more of a classical art song vein rather than the style one expects to hear when coming across a vocalist/big band setting, thus my initial confusion. Katz’s vocal writing, at least to my ears, has more in common melodically and harmonically with 20th Century art song styles. His compositions and orchestrations at times sound as if he’s barely able to control a village mob that’s hellbent on capturing Frankenstein’s monster, while at others it evokes an intimate chamber ensemble by way of his delicate woodwind orchestrations and non-functional harmony. Then consider Katz’s crunchy, swinging 12/8 treatment of bluesman Willie Dixon’s classic “Hoochie Coochie Man,” which features vocals by Mike Finnigan and a nasty guitar solo by Norm Zocher. Katz wrote most of the album’s lyrics – many of which are pretty out there, such as on the two movement work “Visiting My Aunties,” which riffs off “Little Red Riding Hood” and eventually gets into Freud and various permutations of “Aunty”: “Aunty matter,” “Aunty depressant,” “Aunty gun control lobby,” etc). Combine all the aforementioned together, add in a few dashes of freewheeling solos throughout by the powerful trombonist David Harris, tuba-ist Bill Lowe, and altoman Jim Hobbs, and you’ve got a unique and wide ranging, yet surprisingly focused album that should appeal to just about everybody in at least a few ways. There’s a whole lot to unpack in A Wallflower in the Amazon, and although it might sound a bit strange at first, give it a few shots, it will more than likely grow on you (unless you have no sense of adventure, that is). Jazzvox Presents: In Your Own Backyard resides in a whole other universe than Katz’ work. The concept for this record comes from a series of house concerts in the Seattle, Washington area that Nich Anderson produced, which he called JazzVox. The house concerts provided an intimate venue for duos of singers and instrumentalists to present their work. Anderson, who along with pianist Patti Wicks provides a cover of Jule Styne and Sammy Cahn’s “Time After Time” on the record, then decided to take these duos into the studio to document these performances. The end result is a charming and intimate record that features takes of standards such as “You’re Getting to Be a Habit With Me” and “Comes Love” (performed by bassist and vocalist Kristin Korb and pianist Randy Halberstadt), and “I’m Old Fashioned” (by singer Jo Lawry and pianist Bill Anschell). There are also less well known tunes, such as Frank Rosolino’s “Please Don’t Bug Me,” on which pianist and vocalist John Proulx and bassist Chuck Kistler swing like mad. As opposed to Katz’ record, JazzVox Presents is a straight ahead, swinging, and traditional treatment of vocals with accompaniment, and it will certainly appeal to fans of that approach.